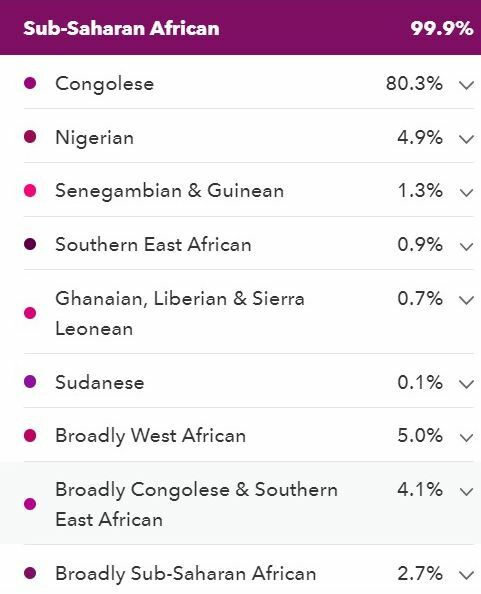 Nine specific regions and 3 broadly macro-regions are now available on 23andme’s Ancestry Composition to describe your origins across the African continent (aside from “Broadly Sub-Saharan African” and “North African & Arabian”). The country name labeling is not to be taken too literally, as always. But it is actually quite indicative if you simply take it as a proxy and also take into account surrounding countries. Despite being less specific it will still also be helpful to distinguish between macro-regional areas within Africa: West African versus Central & Southeast Africa versus Northeast Africa, see also table 1. 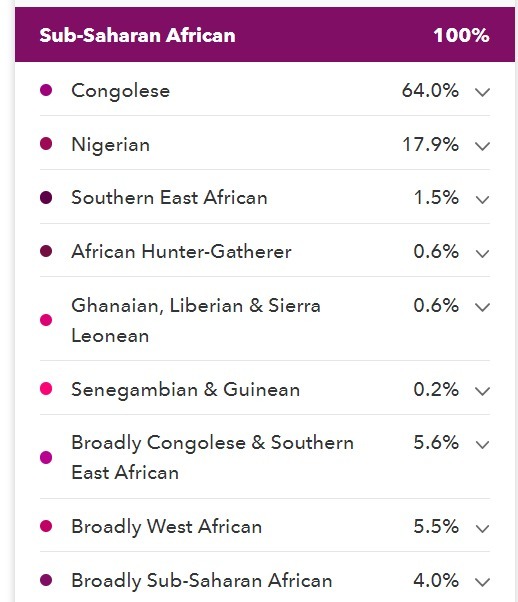 On this page I will be featuring the individual screenshots of Central & Southern African 23andme testers (from Cameroon to Madagascar). Almost all results included in my survey have been shared with me by the DNA testers themselves.2 Some results were also kindly shared with me by friends. And a few results were collected by me from social media. Naturally I verified the background of each sample to the best of my capabilities but I did not have absolute certainty in all cases. 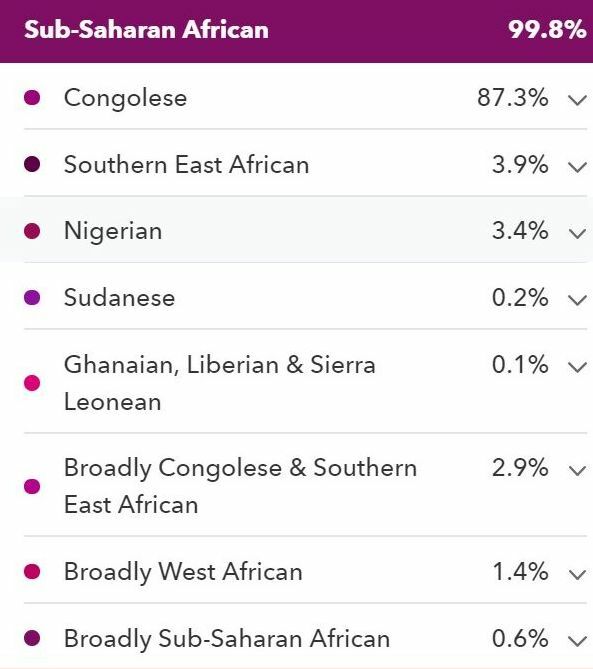 I like to thank all my African survey participants for having tested on 23andme and sharing their results with me so that it may benefit other people as well! At times I will also feature screenshots of people of mixed background. Usually 1 parent being from a specific African country and 1 parent being from Europe or elsewhere. But also Africans with 1 European grandparent, 1 great-grandparent etc.. 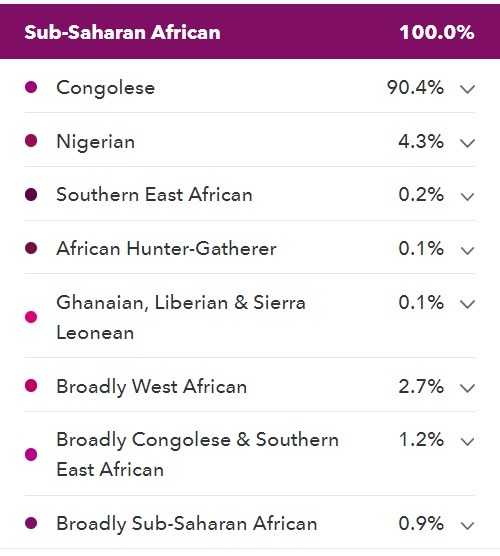 In order to make the African composition results inter-comparable between all my survey participants I have scaled the African part of 23andme’s breakdown to 100% for people of mixed background. I actually find that especially in these mixed cases 23andme’s update really shows it added value. As most of the times also the known African background of mixed people is fairly well described. p.s. I will usually only feature screenshots of the African breakdown. You will notice it will often not add up to an expected 100%. In most cases this is because of a well known “bug” in 23andme’s Ancestry Composition. Which causes people of “100% African” descent to show trace levels of non-African admixture or “unassigned” ancestry. This can generally be considered “noise”, i.e. reflecting an artefact of the DNA test. Hopefully it will be fixed with the next update. In some other cases though the individuals will have genuine additional non-African ancestry. Which might however be “native” to Africa still. Especially if it is related to North African(-like) DNA. Otherwise it might reflect historical geneflow from outside of Africa within the last 500 years or even earlier. This table contains my main survey findings. 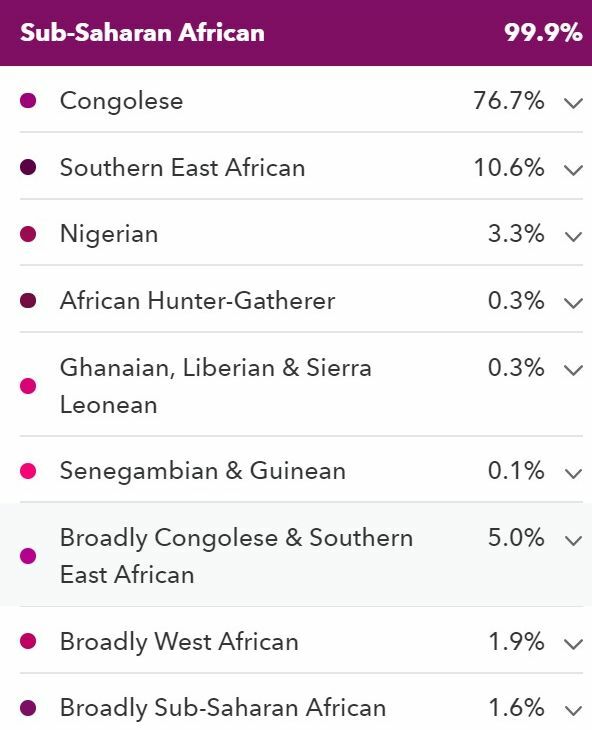 It illustrates how 23andme’s new African breakdown is performing for Central & Southern Africans. Click on this link for an up-to-date version of this table. Although less specific do take notice how also the macro-regional breakdown (West African vs. Central & Southeast African vs. Northeast African) is reasonably in line. The statistical data displayed in table 1 is evidently based on a minimal sample size but still pretty comprehensive already. A few Central & Southern African countries are not yet being covered (such as Gabon, Equatorial Guinea, Malawi, Namibia etc.). All of the included countries themselves harbour a multitude of ethnic groups. Right now however I can only make statistical calculations for a few well represented ethnic groups within 23andme’s customer database. A greater degree of genetic diversity and individual variation might therefore be expected across Central & Southern Africa and also within the listed countries. 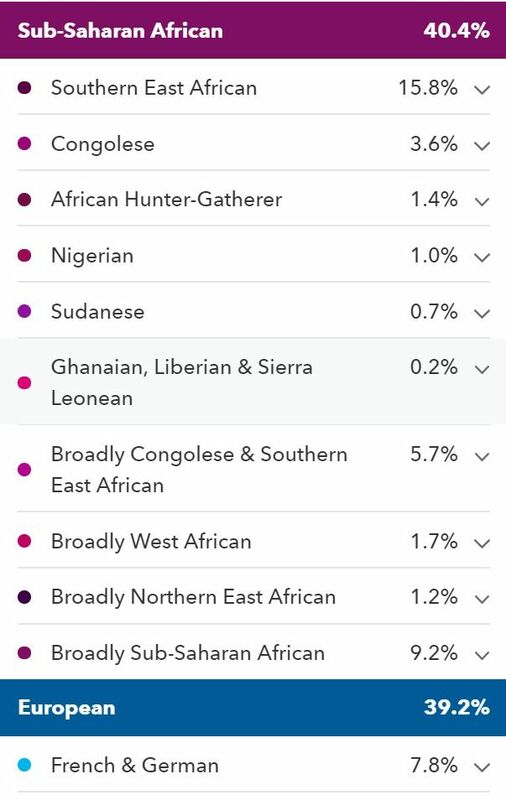 Even though only preliminary statements should be allowed at this stage I still suspect that these group averages are already a reasonably good approximation of the main regional components to be found within the genepool of this part of Africa. 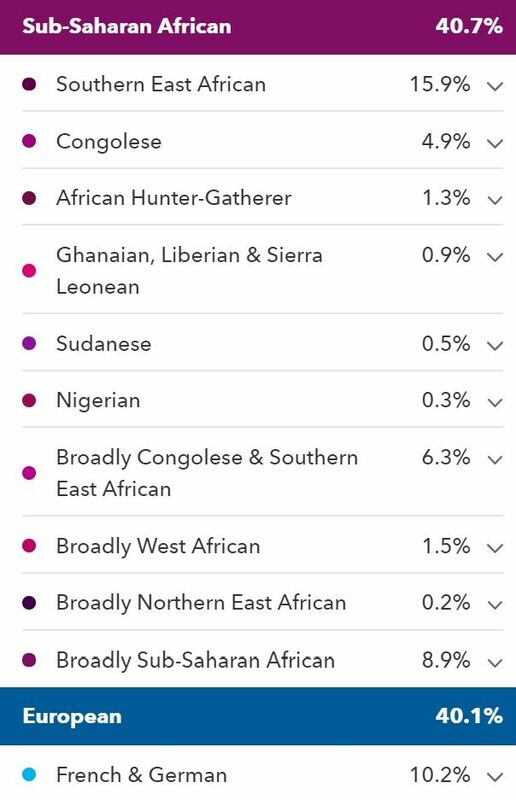 According to 23andme’s new African breakdown obviously 😉 . The group averages I have calculated so far often exceeding 70% for each nationality! Although admittedly intermediate countries such as Cameroon, South Africa and Madagascar are less well captured right now. In particular socalled “Congolese” seems to be prevailing for most countries. As far south as Mozambique and also for one Bantu speaking sample from South Africa it is reaching levels >70%. Of course it also includes Angola and to the north it has a substantial presence in Cameroon as well. But more so among certain ethnic groups closely related to Bantu populations. 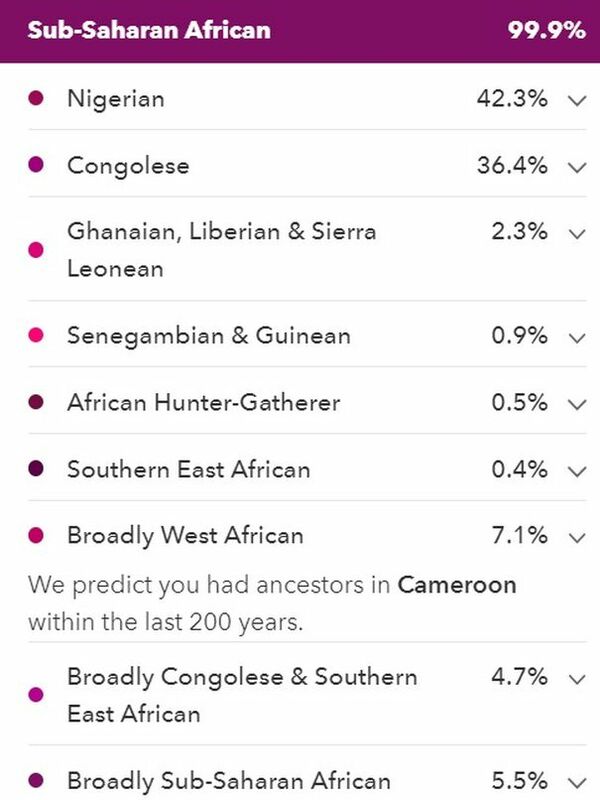 Given the absence of Cameroonian samples on 23andme (unlike Ancestry!) this creates some considerable degree of genetic overlap with “Nigerian” for understandable reasons (Bantu expansion starting in Nigeria). To the east there is also some overlap with “Southern East African”. Especially among those Bantu populations of Kenya and Tanzania which have a lower degree of additional Nilo-Saharan or Cushitic lineage. It is very unfortunate therefore that 23andme chose to apply a country name labeling in this case. It is even more inappropriate than for the 3 new West African regions. As this ‘Congolese” region is in reality measuring genetic similarity among Bantu speaking populations who are dispersed over a far greater territory! It is essential therefore to realize that socalled “Congolese” should really read as “Central & Southern African”. 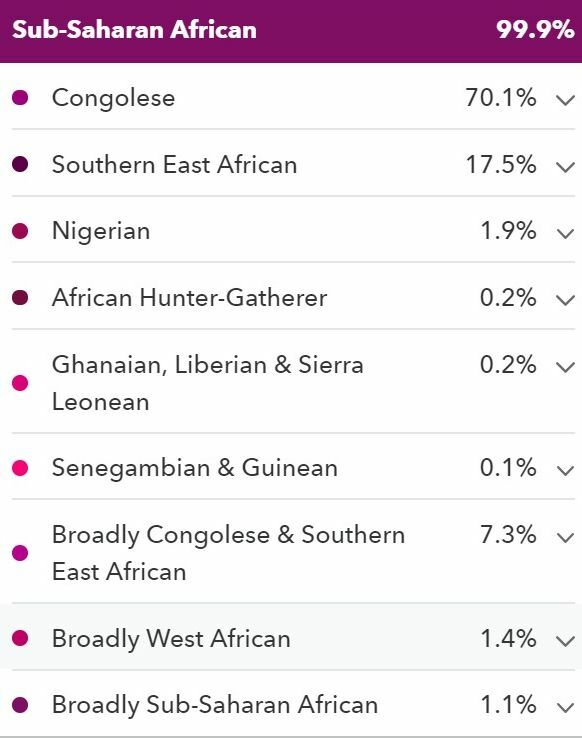 Not unlike how the former “Cameroon/Congo” region on AncestryDNA also expanded further south than expected (based on the labeling). See also map 1 below. Leaving terminology aside I do think it counts as a true improvement that almost all of my samples from this part of Africa (excl. 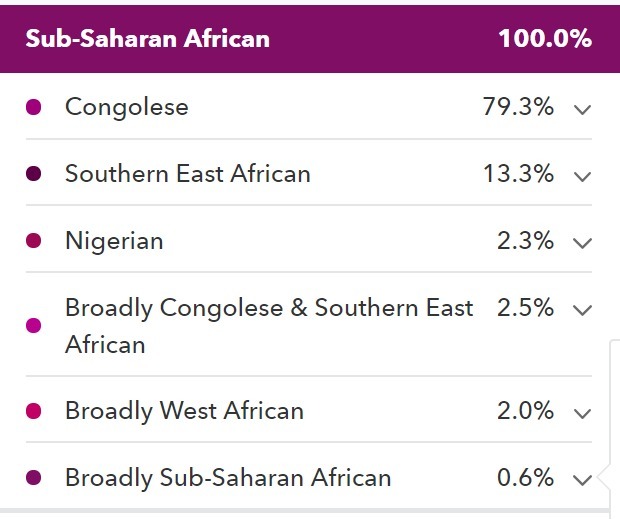 Cameroon, Madagascar & South African Coloureds) are indeed showing up as above 80% Central & Southeast African in table 1 (combining “Congolese” with “Southern East Africa”, “Hunter-Gatherer” & “Broadly C. & SEA” scores). 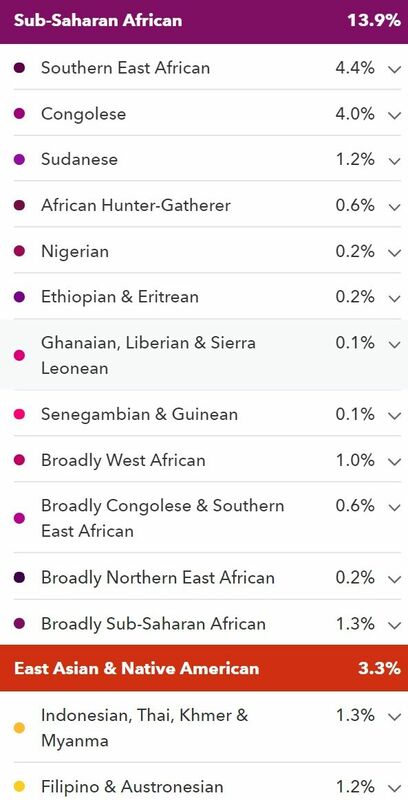 Because formerly the socalled “Central & South African” category on 23andme was only measuring genetic similarity with marginal Hunter-Gather populations. Which resulted in quite misleading “West African” scores for people from this area. Quite ironically it seems that after this update 23andme is no longer able to properly distinguish “Hunter-Gatherer” DNA. The scores for this region have sharply decreased for my survey participants. Especially for Central Africans hardly any Pygmy lineage seems to be picked up anymore. Which might not really be a big loss. Given that in most cases such connections date back to ancient times anyways. And therefore not really relevant for a genealogical time frame (let’s say 500 years). Hunter-Gatherer scores for South African Coloureds on Ancestry (before update). Malagasy are typically a blend of Southeast Asian and Southeast African DNA. Therefore any DNA test result for them should also reflect this. 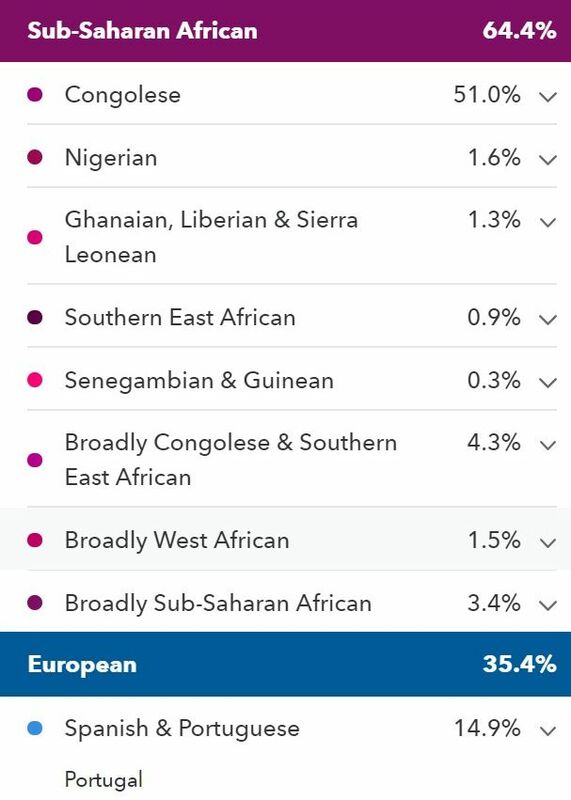 After its most recent update 23andme seems to be almost there. It certainly has made impressive advancements in describing Madagascar origins! Not only by way of the new ancestral location of “Madagascar”. But in particular the refinement of Southeast Asian DNA into “Filipino & Austronesian” as well as “Indonesian, Thai, Khmer & Mynma”. Both of which are appearing for my Malagasy samples! Sofar the question of either “Southern East African” or “Congolese” being most descriptive of Malagasy’s African DNA seems to be inconclusive. As I only have three Malagasy results to go by at this moment. And for one of them actually “Congolese” is clearly predominant, unlike what you might expect. A comparison with Mozambican or Zimbabwean reference populations instead of either Kenyan or Congolese ones probably being much more relevant. See also this recent study. Aside from “Congolese” other regions are also frequently reported for my survey participants. Either as minor genetic components but often also with substantial amounts. Even in the double digits. Usually neighbouring and genetically overlapping regions are involved. In a way these main secondary regions help make each nationality more recognizable. Rather than just focusing on their primary regions which are in no way unique to any given country! For example Zimbabweans will usually have “Southern East Africa” as secondary region. While for some Cameroonians “Nigerian” comes in second place, but often even in first place! The new socalled “Congolese region is not restricted to Congolese origins only! A far better fitting label would have been “Central & Southern African Bantu”. As my survey findings clearly demonstrate that this “Congolese” region can be found as far south as Mozambique and South Africa! To the north it also has a substantial presence in Cameroon. But more so among certain ethnic groups closely related to Bantu populations. 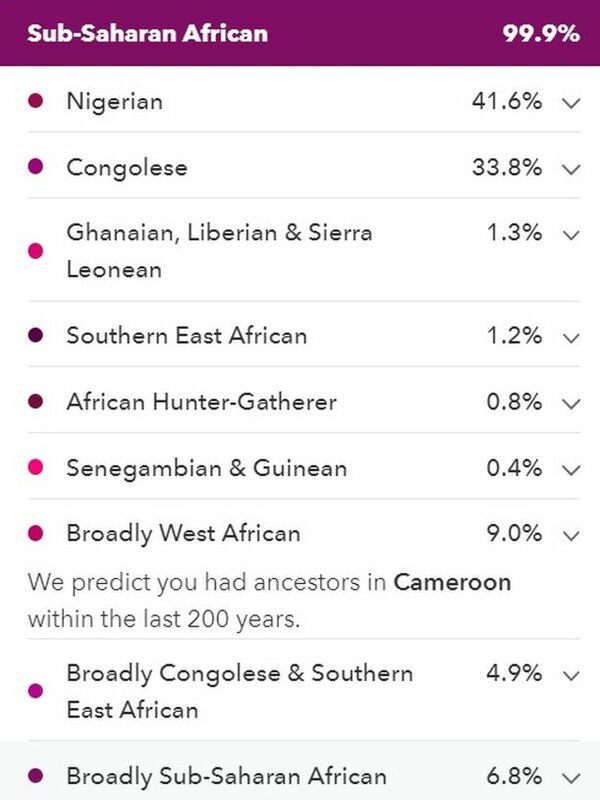 Given the absence of Cameroonian samples on 23andme (unlike Ancestry!) this creates considerable genetic overlap with “Nigerian”, for understandable reasons. To the east there is also some overlap with “Southern East African”. Especially among Bantu populations of Kenya and Tanzania which have a lower degree of additional Nilo-Saharan or Cushitic lineage. The “Congolese” region can be quite predictive for Congolese themselves. However it is only natural it will show a great deal of variation given the enormous size and ethnic diversity of this country. Because of the usage of Congolese samples the true degree of “Hunter-Gatherer” (Pygmy) ancestry looks to be greatly understated. However in most cases such connections date back to ancient times anyways. And therefore not really relevant for a genealogical time frame (let’s say 500 years). Although still predominant the “Congolese” score is on the lower end of the range for my survey participants. 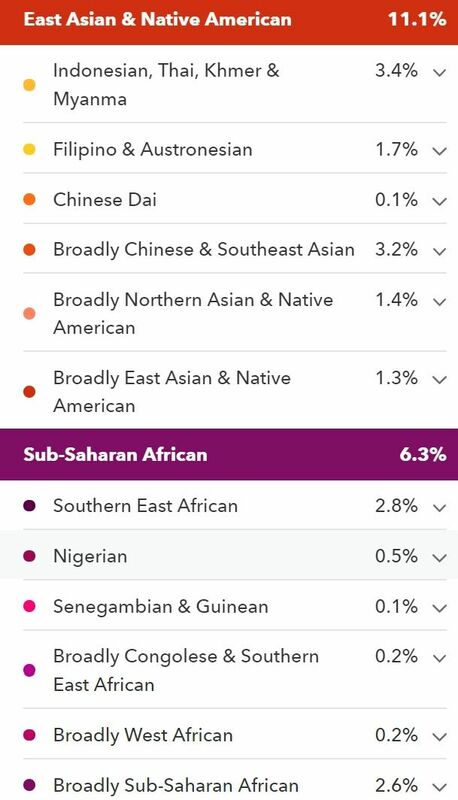 A considerable “Nigerian” score is appearing to which should be added the “Broadly West African” score. When taken literally of course misleading. 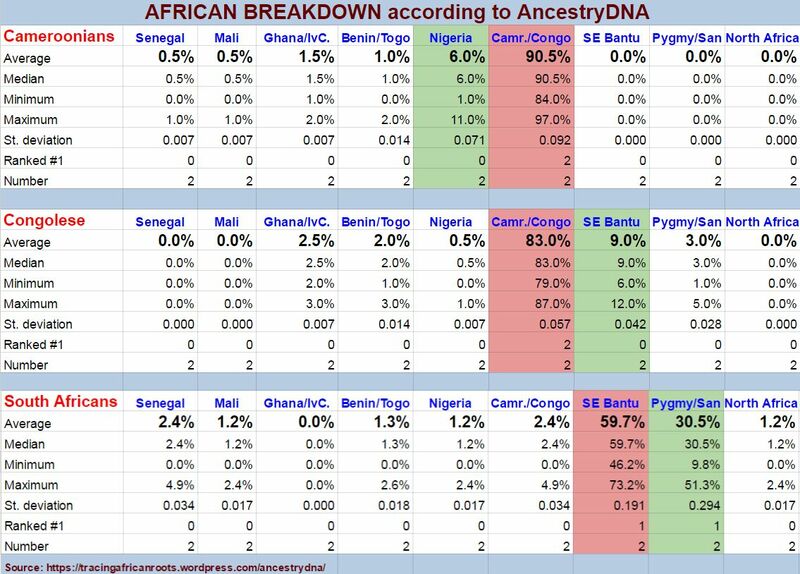 However genetic similarity and therefore overlap between Nigerians and Central Africans seems to be inevitable in DNA testing given the Bantu migrations. Even lower “Congolese score for this person. 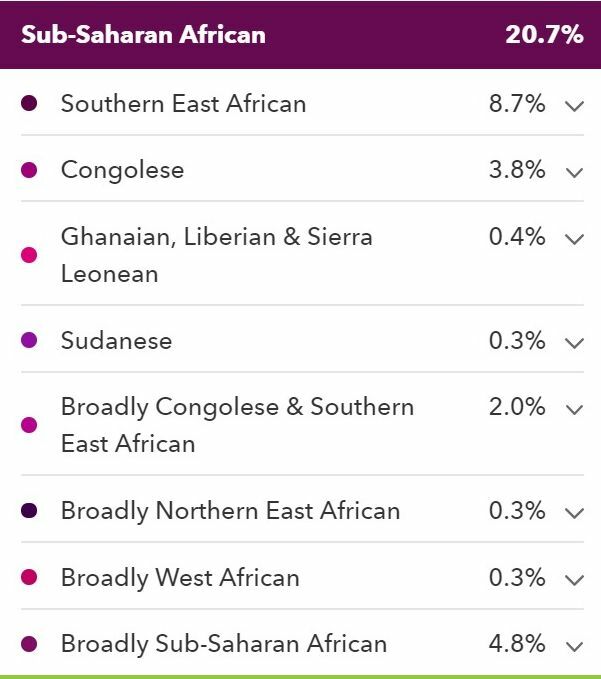 However when you add “Broadly Congolese & Southern East African” as well as “Southern East African” you end up with about 75% of this person’s origins being described as Central & Southern African. Which is still pretty informative when interpreted correctly. Quite pronounced “Southern East African” score for this person with only one Congolese parent. Even unscaled it is the highest such score I have seen among my Congolese survey participants. Even higher scores might be possible though. I imagine in particular among eastern Congolese. 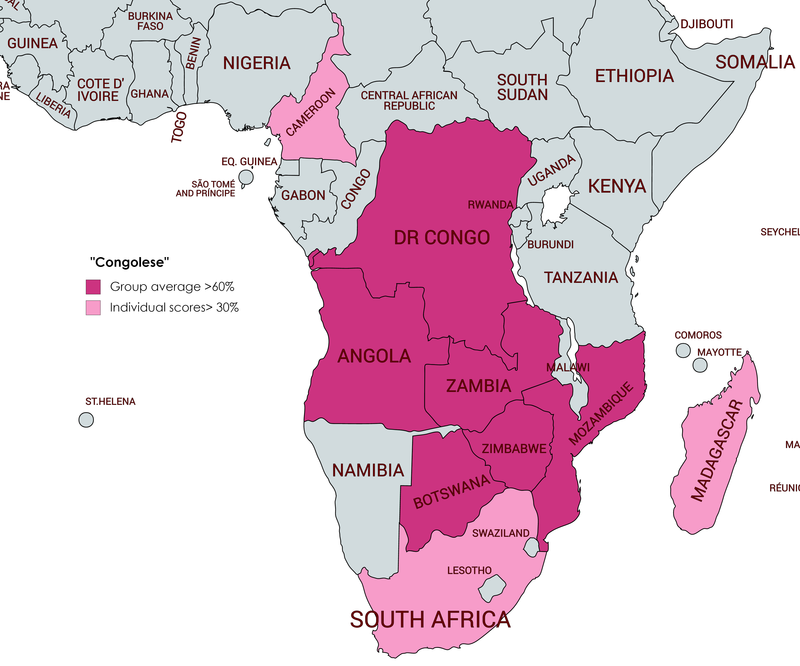 The “Congolese” region also describes Angolan DNA. 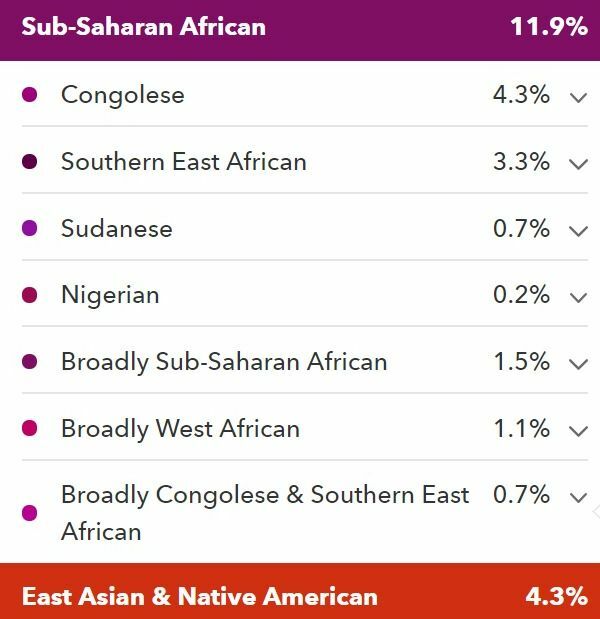 As clearly demonstrated by this result for an Angolan of mixed background (=Mestiço). Taking his African breakdown as 100% his scaled “Congolese” score is nearly 80%! (51/64.4=79.2%). 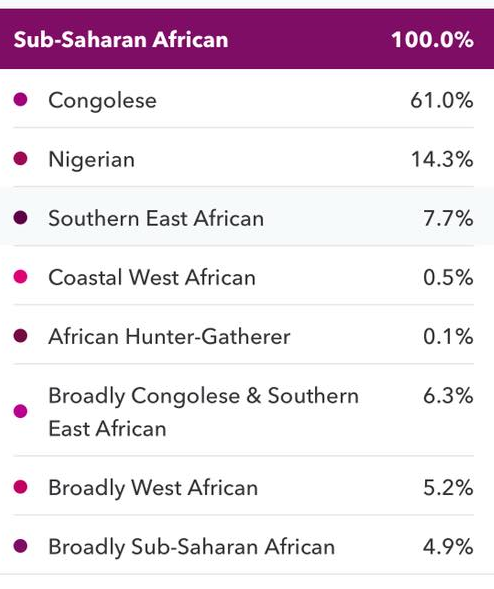 Take note also btw how 23andme correctly assigns “Portugal” as ancestral location. If this person also had been of partial Cape Verdean descent most likely “Cabo Verde” would have appeared as ancestral location as well. 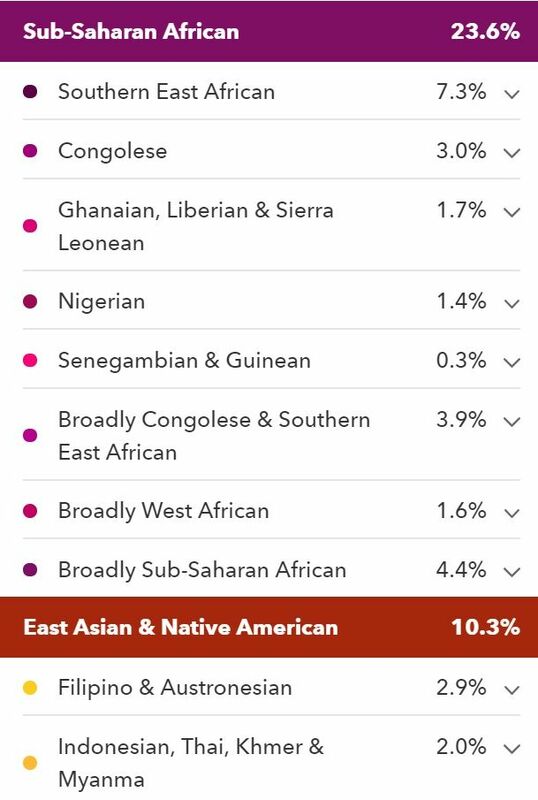 Plus “Senegambian & Guinean” would have been much more elevated. I actually have several Angolan DNA cousins who have partial Cape Verdean background on Ancestry. Because this person is also half Cameroonian we cannot be sure how high “Nigerian” levels might get for fully Gabonese. 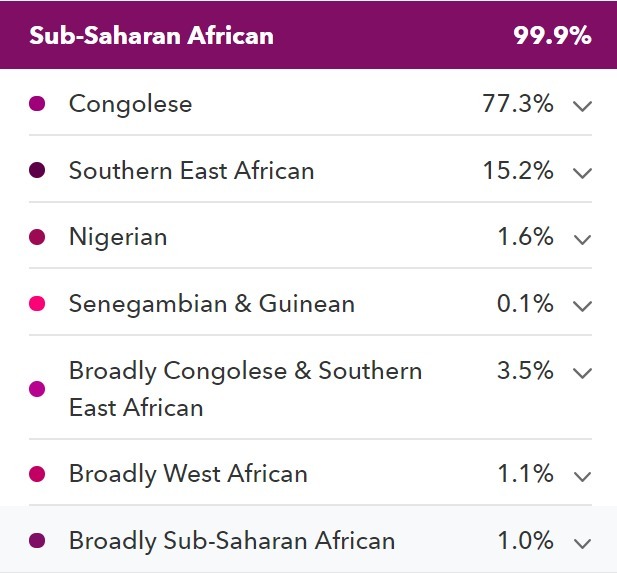 However judging from the double digit “Nigerian” scores among Congolese it seems logical to assume a gradient for “Nigerian” scores which will also affect people of 100% Gabonese descent. Although “Congolese” is still predominant for this person. This person shows the highest “Congolese” score among my Cameroonian survey participants sofar. Which makes sense given her background. The Ewondo and Bulu both being Bantu speaking populations (see this link). For other Cameroonians “Nigeria” will appear more prominently, correlating with ethnic background and geography. Incidentally this is also the only person from Cameroon sofar who did not receive “Cameroon” as ancestral location. 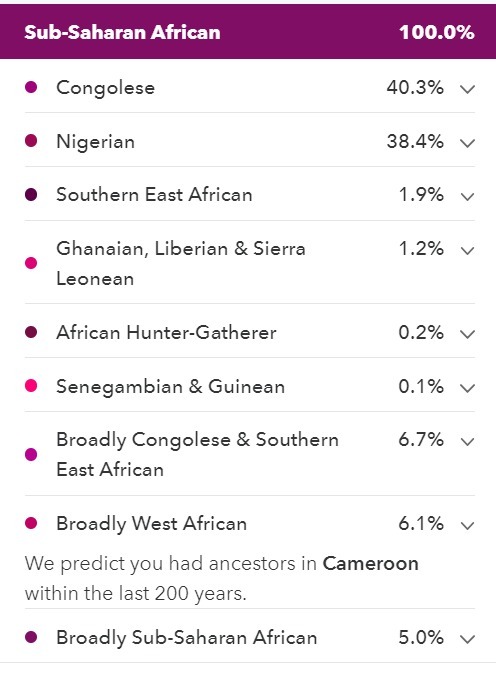 Almost 50/50 split between Congolese” and “Nigerian”, which is to be expected given that 23andme does not use any Cameroonian samples (at least not for admixture analysis). And geographically speaking Cameroon is right in between. Do also notice the correct assignment of “Cameroon” as ancestral location. Based on IBD matching rather than admixture analysis. 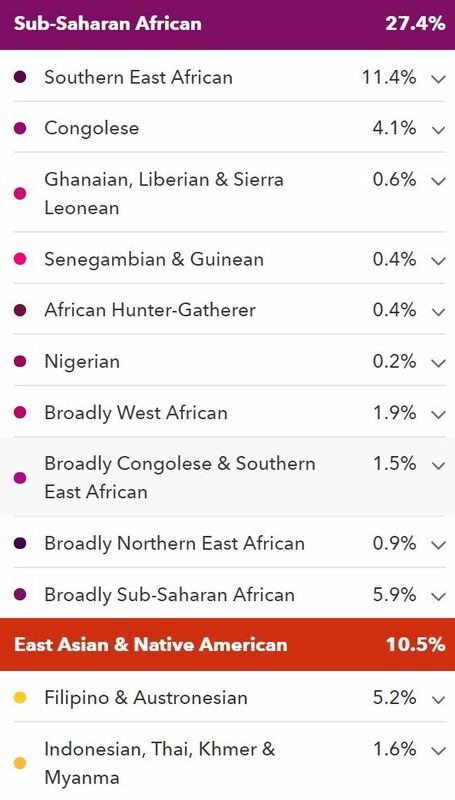 This new feature on 23andme serves to specify ones more recent lineage. And it does its job quite well, at least for Cameroonians themselves. 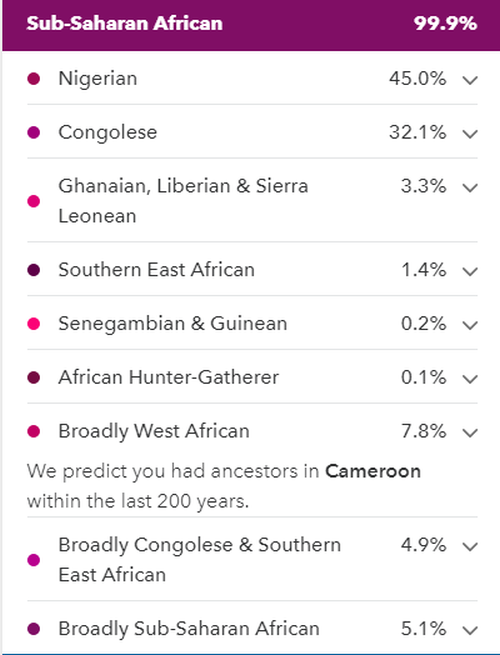 “Cameroon” was correctly mentioned 7/8 times as ancestral location among my survey participants. Given how close Bamenda is to the Nigerian border not really surprising that this Cameroonian received the highest “Nigerian” score sofar. The absence of a separate “Cameroon” region might be bothersome. 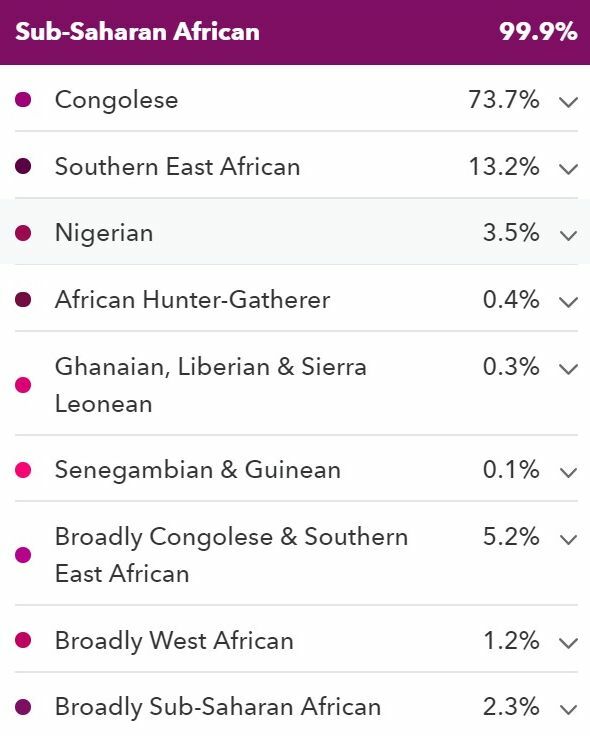 But I suppose the cutting out of the middle ground between Nigeria and the Congo may have resulted in a sharper delineation for southern Nigerian DNA. For Afro-Diasporans the possibility of “Nigeria” actually also including some Cameroonian lineage does remain relevant. 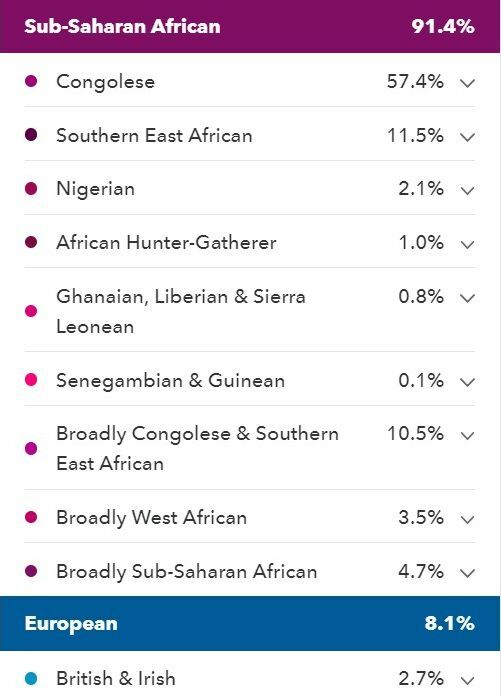 Even when the odds of it really being southern Nigerian are usually higher. See also: “Cameroon/Congo” = moreso Angola/Congo for Diasporans? 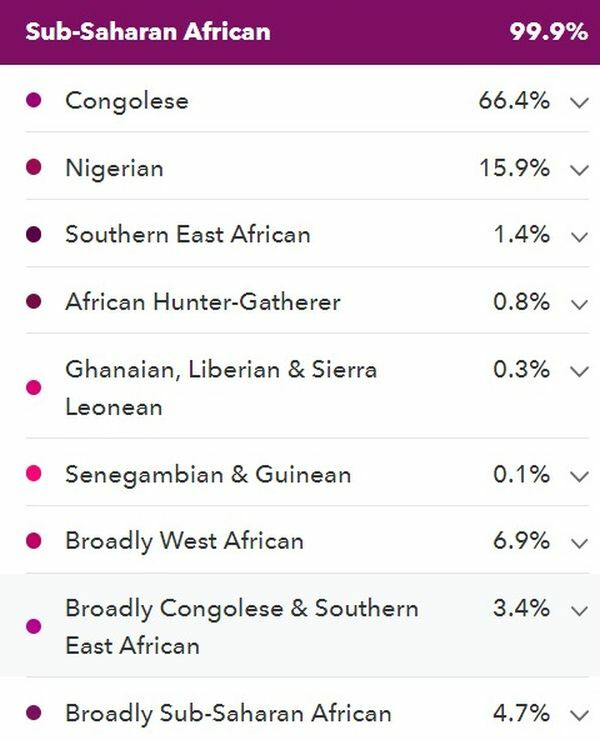 Given close ancestral connections between Zambia and (southern) Congo (see this link) this breakdown is pretty much as expected. 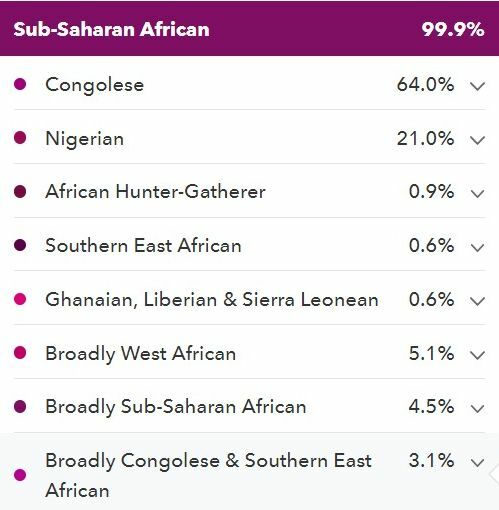 The “Southern East African” score only serving to underline a slight genetic shift to the east, compared with 23andme’s Congolese reference samples. Quite similar to the Zambian results above. “Congolese” clearly predominant. Even though geographically speaking Zimbabwe can be considered a Southeast African country. 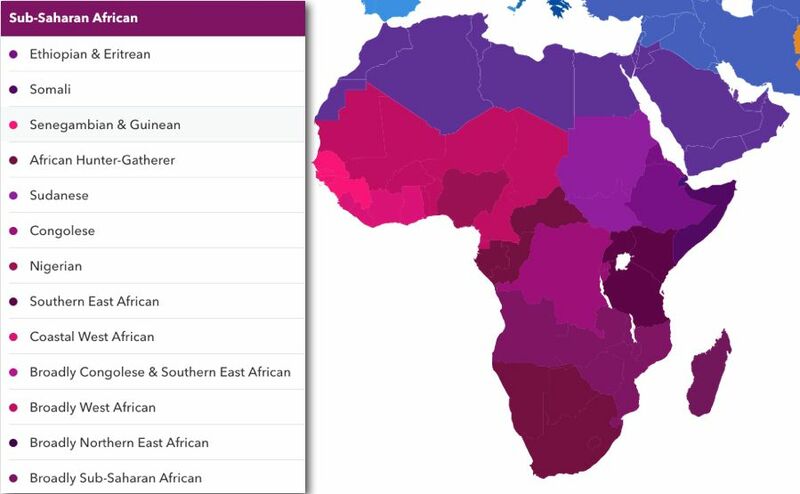 The “Southern East African” score is only secondary. Knowing which samples were used for each region is essential to understand this outcome. 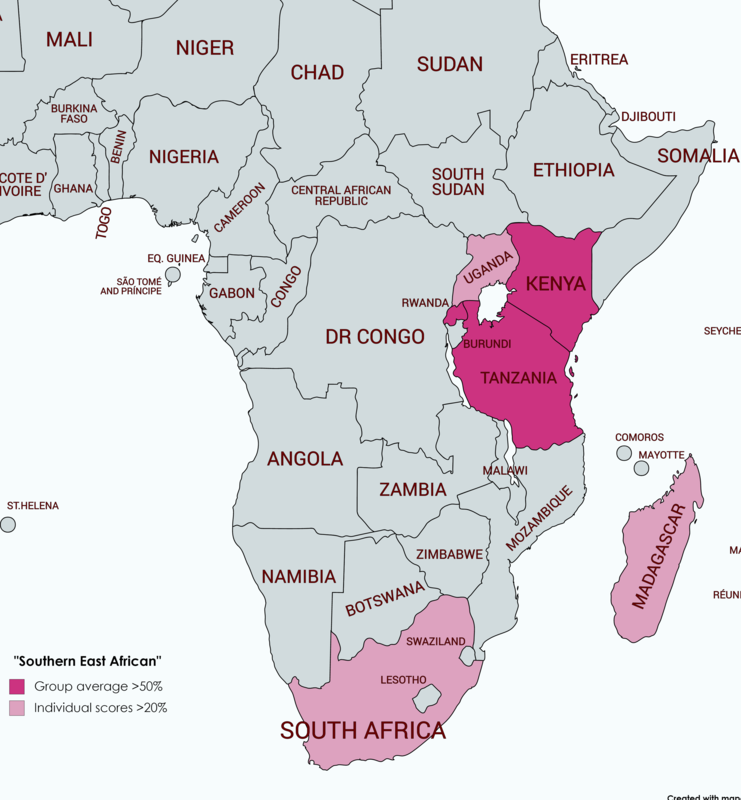 The latter region being more so based on samples from Swahili countries: Kenya, Tanzania, Uganda & Ruanda (see this link).. Actually on AncestryDNA the former “Cameroon/Congo” region also expanded as far south as Zimbabwe, despite a separate “Southeastern Bantu” region! But in more balanced proportions. See also: Central & Southern African AncestryDNA Results. Yet again “Congolese” predominant and “Southern East African” secondary. The minor European admixture shown for this person and the one directly above is interesting. It may convey the impression their results could be mistaken for a West Indian or African American person with a similar degree of European admixture. However their African breakdown is way too distinctive. And I can already venture to say that such a Central/Southern African predominance will not be attainable for regular Afro-Diasporans, safe perhaps some Afro-Brazilians. However for them any European admixture should come out as primarily “Spanish & Portuguese”. Quite ironic that “Southern East African is minimal for this Mozambican, not even 4%! Even when Mozambique, in my book atleast, counts as quintessentially Southeast African! (see this page). Instead “Congolese” is clearly prevailing. In fact at nearly 90% it is one of the highest scores I have seen in my survey! This goes to show the arbitrariness of geographical definitions 😉 Of course this is just one sample from Mozambique to go by. 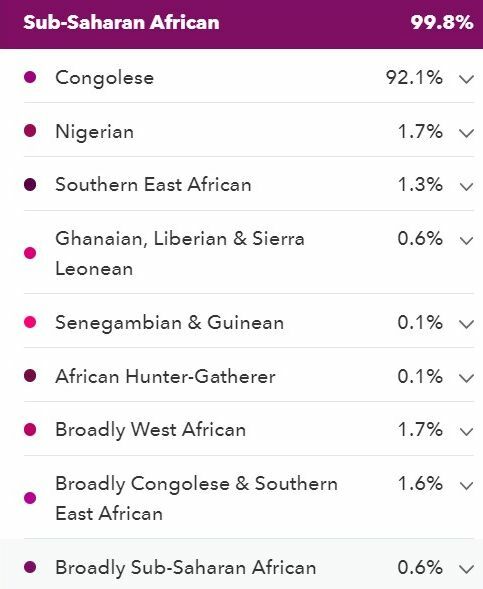 But the pattern is quite apparent when also taking into account the results of 5 Zimbabweans, 1 person from Botswana and one South African Bantu speaker (see below): “Congolese” on 23andme serves as an indicator of Bantu ancestry. Not only in Central Africa but also in Southern Africa! The labeling of this region may be referring to the southeast of Africa. But the real focus seems to be on DNA from the Swahili countries: Tanzania, Kenya, Ruanda and Uganda. Which are located more so in the central part of East Africa. 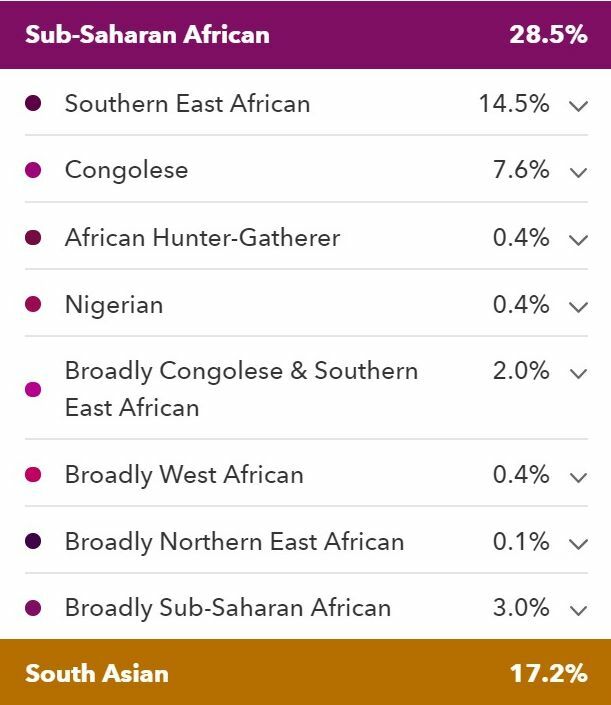 A bit confusing but 23andme probably just wanted to make a distinction with their Northeast African regions, centered on the socalled Horn countries. For Afro-Diasporans it is worthwhile to know that Malagasy DNA is also described by this region. But not convincingly so (23.4% on average sofar and 20.3% for “Congolese”). The same goes for South African Coloureds, among whom I found a group average of 40%. For Bantu speaking populations from Southern Africa “Congolese” however remains predominant. “Southern East African” scores among my survey participants from this area are mostly in between 10-20%. But it can get as low as 4% for one of my Mozambican samples! Not an equivalent of the former “Southeast Bantu” region on Ancestry therefore. 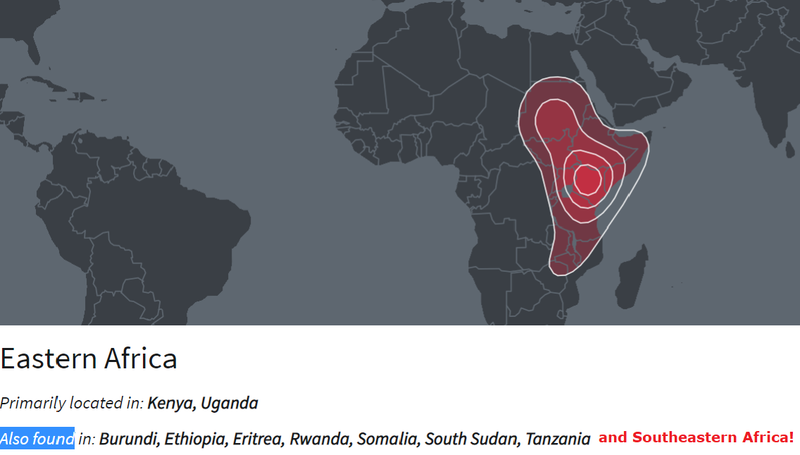 Perhaps more similar in scope to Ancestry’s new “Eastern African” region. Except it does not really go northwards beyond Kenya and Uganda. I have no certainty but going by the surname this South African result probably belongs to person of Sotho descent. Quite remarkable that “Congolese” is still predominant, even among South African Bantu speakers. As can be seen further below it is different for South African Coloureds though! 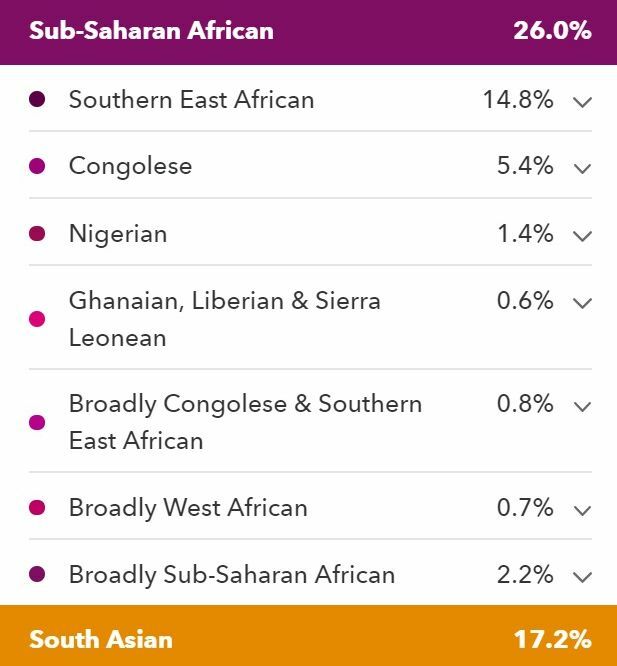 The underlying reason for this outcome most likely has to do with the selection of African reference samples by 23andme. These do not include South African ones (see this link).. Unlike on Ancestry with its former “Southeast Bantu” region, which used to be very predictive of South African Bantu DNA. and at the same time also still indicative of Khoi-San lineage. Both “Southern East African” and Congolese” are significant components in the African breakdown of South African Coloureds. But proportionally speaking “Congolese” is clearly less important than for my Bantu speaking samples. An intriguing outcome. But possibly just caused by how 23andme is severely underestimating Khoi-San lineage. Resulting in a shift to “Southern East African”. Take note btw how this person’s English lineage is being confirmed by “United Kingdom” as ancestral location. The “Hunter-Gatherer” scores on 23andme are supposed to be indicative of Khoi-San lineage. But 23andme no longer seems able to detect Khoi-San lineage in its true proportions. It is known from several DNA studies as well as my own previous survey findings that Khoi-San DNA is a very important and often even principal ancestral component (within the African breakdown) for South African Coloureds. However for some reason this is no longer showing up. Similar I guess to how Pygmy ancestry is now mostly submerged for Central Africans and also how North African(-like) DNA has almost dissappeared for Fula people as well as Iberians & Hispanics! See also: 23andme results for South African Coloureds before the update; Hunter-Gatherer scores for South African Coloureds on Ancestry (before update). Only South African Coloured breakdown sofar showing a reversed ranking with “Congolese” in first place and “Southern East African” in second place. Perhaps simply having to do with recombination and a relatively low amount of total African DNA. But possibly this person has a higher than average degree of South African Bantu lineage. Generally speaking South African Coloured’s African lineage derives from other populations though (Khoi-San, Madagascar, Mozambique, and even West Africa & Angola for a very minor part, see this page). Sofar the question of either “Southern East African” or “Congolese” being most descriptive of Malagasy’s African DNA seems to be inconclusive. As I only have three Malagasy results to go by at this moment. For this person “Southern East African” is clearly predominant. However notice how actually “Broadly Sub-Saharan African” is the biggest component in the African breakdown! Very atypical among my other African survey participants, for whom this region is usually quite subdued. 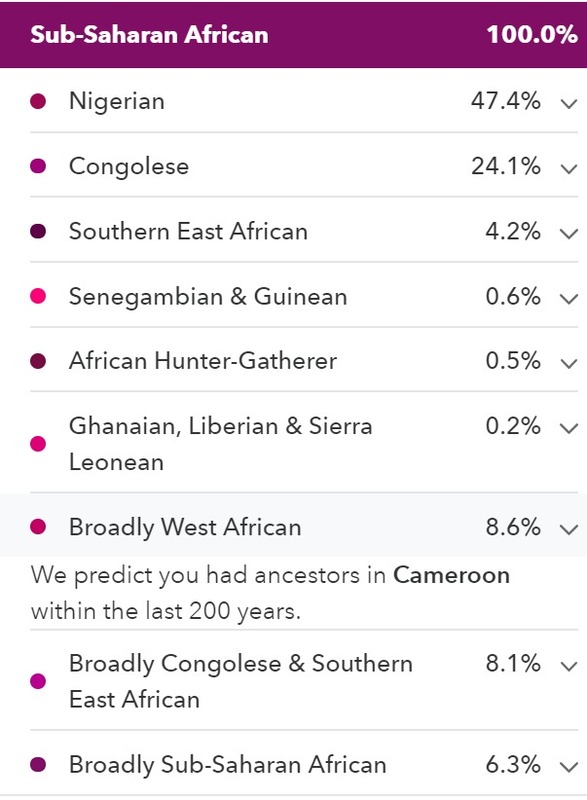 I suppose it might be an indication of how 23andme’s current reference populations are not well-equipped to cover the African ancestral part of Malagasy. A comparison with Mozambican or Zimbabwean samples instead of either Kenyan or Congolese ones probably being much more relevant. See also this recent study. Malagasy are a typical blend of Southeast Asian and Southeastern Bantu DNA. Therefore any DNA test result for them should also reflect this. 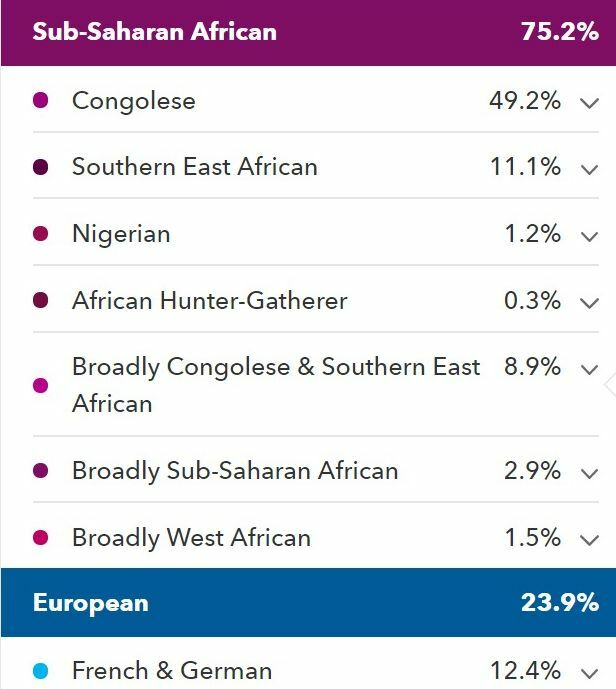 After its most recent update 23andme seems to be almost there. It certainly has made impressive advancements! Do also notice the correct assignment of “Madagascar” as ancestral location. Based on IBD matching rather than admixture analysis. 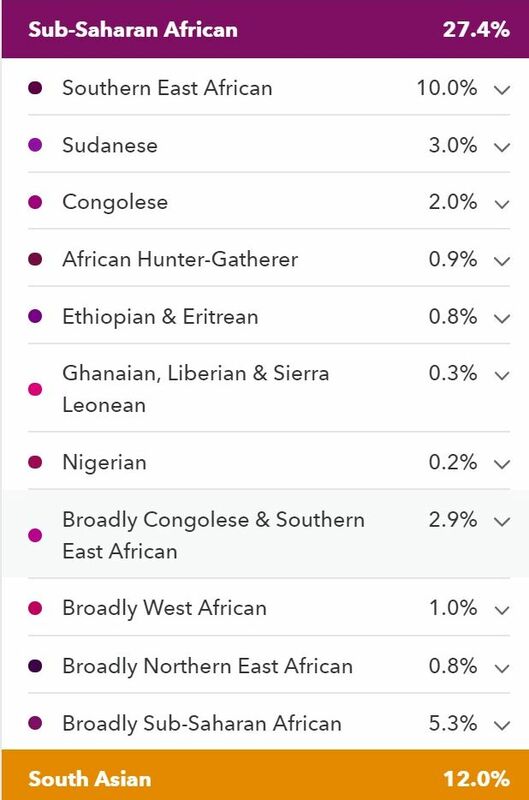 This new feature on 23andme serves to specify ones more recent lineage. And it does its job rather well, at least for Malagasy themselves. “Madagascar” was correctly mentioned 3/4 times as ancestral location among my survey participants. Another interesting aspect btw is the minor but still quite substantial European score for this person. It is usually much more subdued but from what I have seen not completely uncommon among other Malagasy. 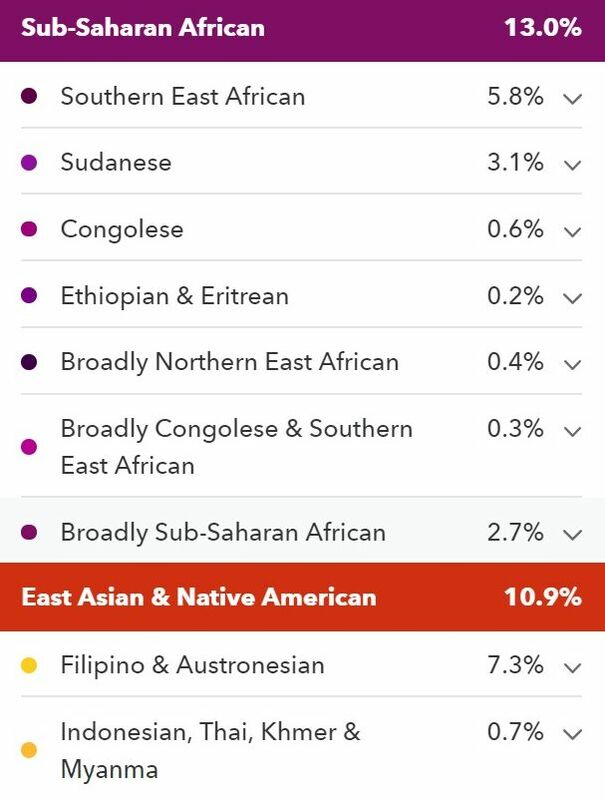 For Afro-Diasporans this might present a complicating circumstance when receiving a Malagasy DNA match. As they could then actually also share a European MRCA. “Congolese” in first place for this particular person. I imagine this might occur more frequently among Malagasy with higher amounts of African admixture. And in this way could be correlated with ethnic/geographic background within Madagascar. I have observed such individual variation also on Ancestry. “Cameroon/Congo” appearing as primary region, rather than the expected “Southeastern Bantu”, especially for coastal people. While it was the other way around for the Merina, from the highlands, who tend to have the lowest amounts of African admixture. Scroll down to Madagascar results on this page, for more discussion & references. 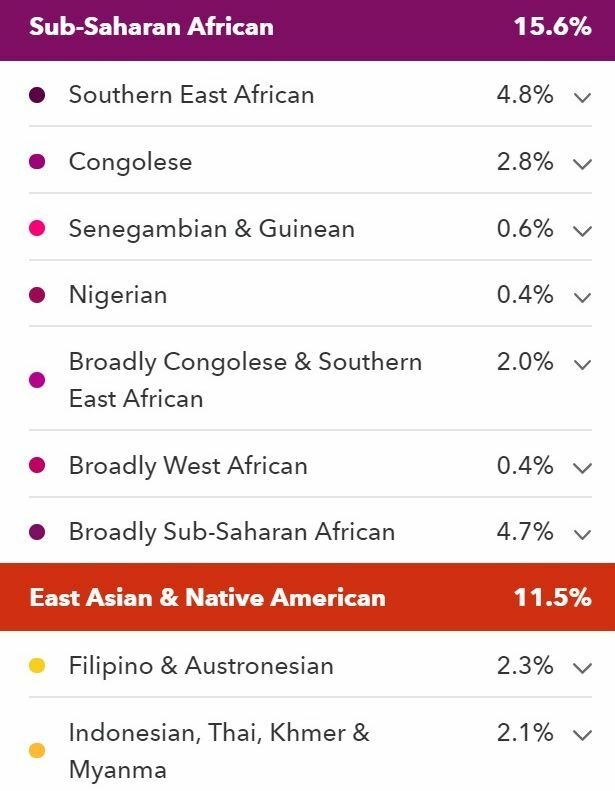 Very useful to see this breakdown for a person who only has 1 Malagasy grandparent. He is French otherwise (and also received “France” as ancestral location!). This allows a demonstration of how dilution of Malagasy DNA looks like. Tellingly this person did not receive “Madagascar” as ancestral location for example. This is especially relevant for Malagasy descended Afro-Diasporans. In this case of course the connection is still quite recent and the gap is only two generations. However taking African Americans as an example it will be a much longer time span which separates them from any Malagasy ancestor. And therefore also the dilution will be more pronounced (see also this page). Indian Ocean Islanders, such as people from Reunion, Mauritius, the Comoros and the Seychelles, form a very fascinating part of the Afro-Diaspora. They often tend to show signs of significant Malagasy ancestry. As showcased in this screenshot and the one below by the additional Southeast Asian scores. It might be useful to compare the level of Southeast Asian scores among Indian Ocean Islanders with the ones obtained by Trans-Atlantic Afro-Diasporans. Especially African Americans. As it may have implications about dilution across the generations. Although Malagasy themselves show great variation in their Southeast Asian admixture proportions I find it intriguing how the person with one Malagasy grandparent above shows a similar level of Southeast Asian DNA (~10%) as this person from Reunion and the one below from the Seychelles. However the “Congolese” and “Southern East African” scores are not a tell-tale signs of Malagasy ancestry. Because many captives in the Indian Ocean islands islands were actually also brought over from Mozambique and further north, people from the interior of the Swahili Coast. So in that way the African breakdown is less exclusively to be assigned to just Madagascar, as it may very well reflect origins from across South Eastern Africa (up to Kenya). Combined Central & Southern African origins are certainly predominant, as is to be expected. Still interesting to also see the minor but still quite noticeable scores for West African regions (especially the ones >1%). A small but still solidly documented part of the African captives brought over to the Indian Ocean Islands did in fact originate in West Africa. 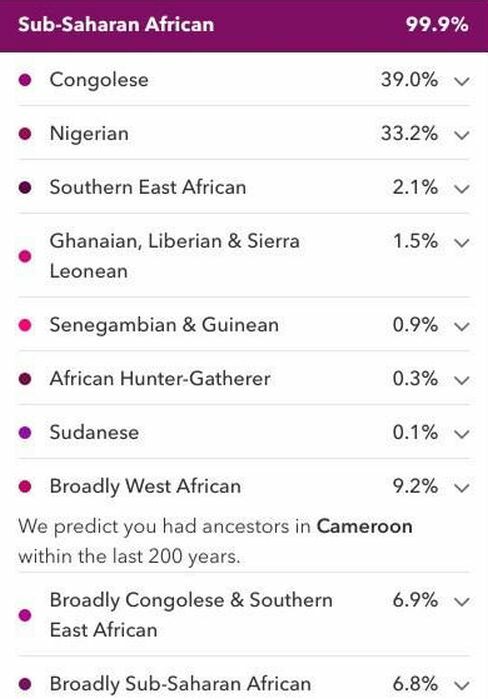 Certainly 23andme is not always correct and may mistake Central African DNA for West African DNA. Nonetheless this outcome might also be a fascinating scenario to ponder. 1) Sometimes it almost seems that admixture analysis is being considered mere guessology by its fiercest critics. Or only fit for cocktail parties as the saying goes 😉 This has however not been my experience. I do agree that performance among the various DNA testing companies and third party websites is very variable. And obviously even more so going back in time. 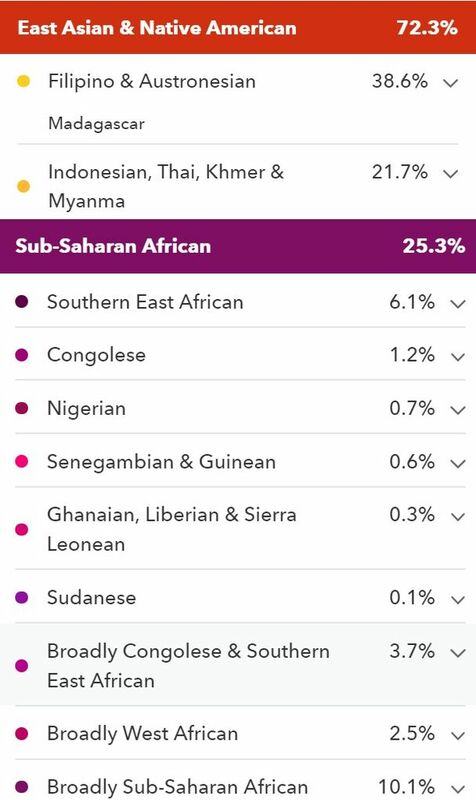 I have myself only tested with 23andme and Ancestry and I found that with correct interpretation and knowledge of their methodology you can indeed derive useful information from admixture/ethnicity results. Which were of course not just pulled out of a hat. 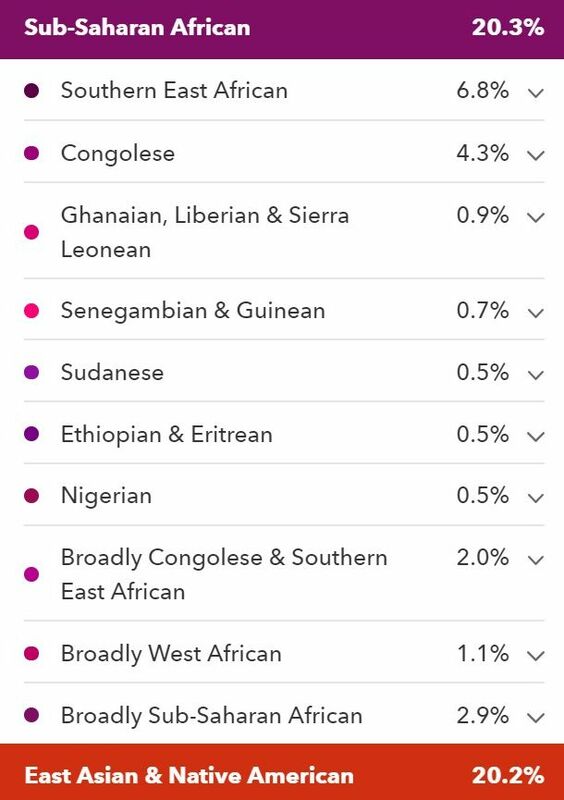 I strongly believe that when Tracing African Roots most people do not have the luxury to be snobbish about admixture analysis. Instead they will want to maximize informational value from any promising source available, despite shortcomings. Combining with other research findings (DNA matches, genealogy, relevant historical context, other types of DNA testing, etc.). in order to achieve complementarity rather than putting all your eggs in just one basket. 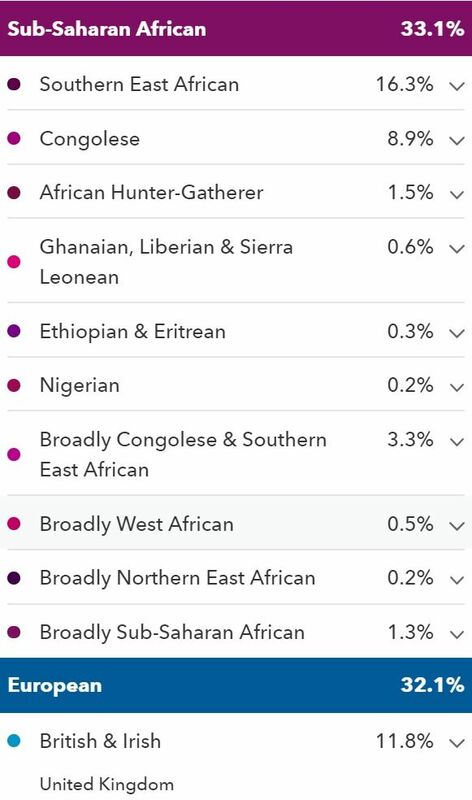 I know of many people who made important discoveries about their genetic ancestry by using their admixture results a.k.a. ethnicity estimates. 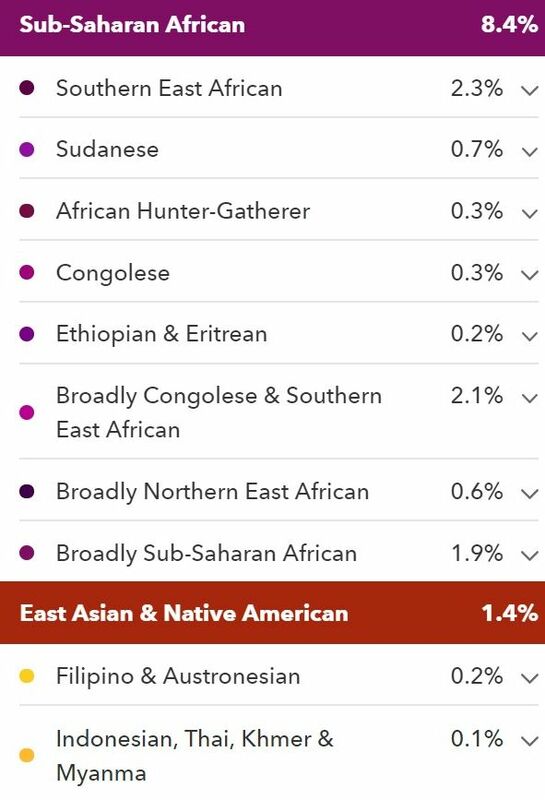 For example I have heard several stories by West Indians who had unexpected Asian admixture, minor but still substantial (>10%). And this information was really useful to them as it lead them to previously unknown Asian contract labourer ancestors. There are plenty of other ancestral scenarios for Afro-Diasporans which can be illuminated by way of the continental breakdown which is usually quite accurate. The regional or subcontinental percentages are indeed not to be taken all too literally. But again I know several persons who did rely on distinctive regional scores to make a breakthrough in their ancestral quest. For example I have been told about at least three instances of NPE being confirmed whereby the father turned out to be East African instead of African American or West Indian. 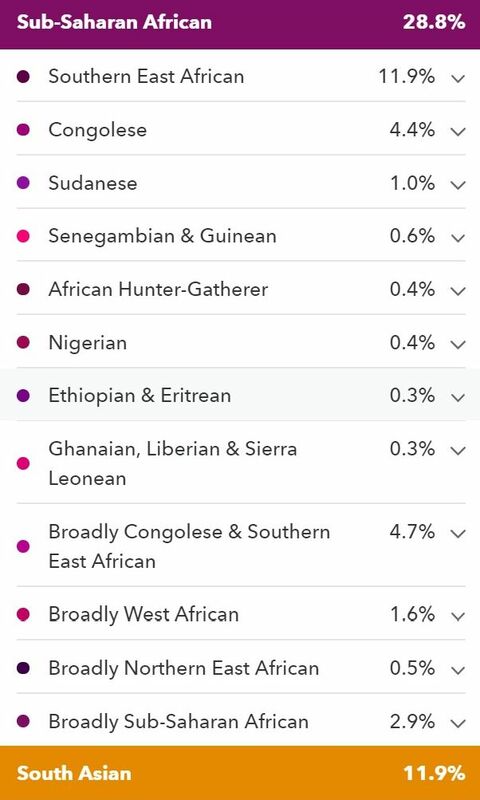 In one case indicated by the very predictive “East African” category on 23andme (pre-update) but also by a singular combination of “Southeastern Bantu” and “Middle Eastern” regional scores on AncestryDNA. 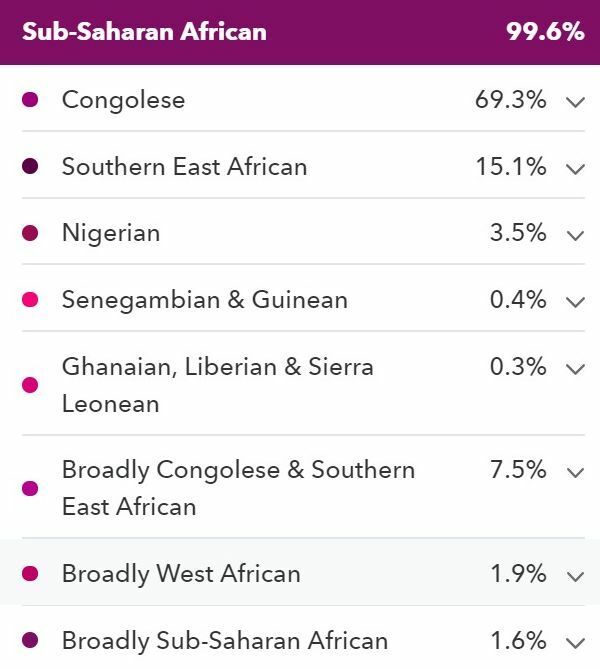 Many times I have also seen how unexpected partial Cape Verdean lineage could quite reliably be corroborated by “Senegal” scores on AncestryDNA. Not only for African Americans, but also for Hawaiians (due to whaling connections, see upcoming blog post)!